Comodo Client Security for Linux (CCS) offers complete protection against viruses, worms and Trojan horses for Linux based computers. The software is easy to setup and features real-time virus monitoring, full event logging, scheduled scans and more. To run a virus scan, click the 'Scan Now' link on the summary screen. To scan individual items, drag them into the scan box in the 'Summary' area. Use the links below to jump to the section that you need help with. Introduction - An overview of Comodo Client - Security for Linux. The Summary Screen - At-a-glance details of important settings, activity and other information. 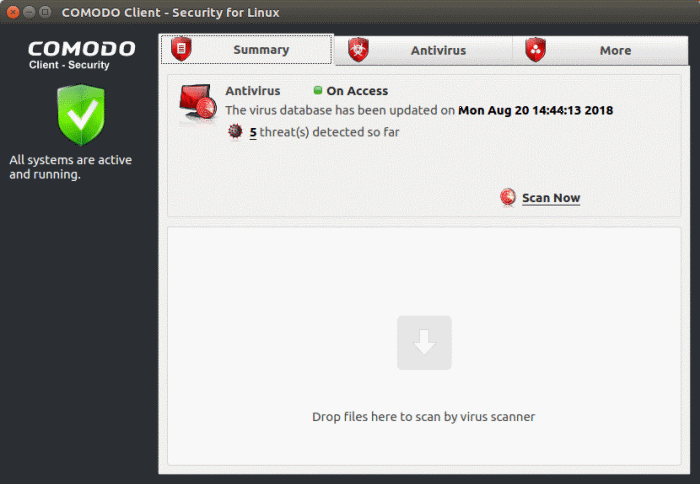 Antivirus Tasks – Introduction - Run scans, configure settings, schedules, updates, scan profiles and more. More Options – Introduction - Overall configuration of Comodo Client – Security and view logs. Appendix 1 CCS for Linux How to... Tutorials - Step-by-step guidance on key tasks of Comodo Client Security.